Westbrook grew up moving antiques for his grandfather’s auction house in a “small, one-red-light town” outside Augusta. After spending his 20s employed in Charleston food and bev, he made the switch back to his childhood gig—but this time at the helm of his own business. “I started out working locally with Tucker Payne Antiques, and Tucker referred me to other antiques dealers and interior designers, as well as Historic Charleston Foundation,” says Westbrook. Westbrook Corp. disassembled this limestone gazebo in Atlanta and hand-delivered it to California. In six years, the Westbrook Corp. fleet has grown from a single truck to seven vehicles used for in-town household moves and cross-country journeys alike. For the company’s founder, a perk of hitting the road with his pup, Jack Straw, is catching iconic concerts along the way. “I took my sprinter van to Chicago for the Grateful Dead’s ‘Fare Thee Well’ show and picked up two Bugatti cabinets while I was there,” Westbrook notes. While the show tickets may be considered a splurge, those cabinets could retail for up to $95,000—each. ➼ Largest markets: For household moves, Charleston and Atlanta are huge. Westbrook trucks also run regular routes to New York City, New Orleans, Miami, Chicago, and cities out west like Jackson Hole. ➼ Worst learning experience: After a move, Westbrook unwrapped a huge limestone statue to find an old hairline fracture had opened up. “And we’d packed the hell out of it,” he says. Westbrook Corp. no longer insures limestone. 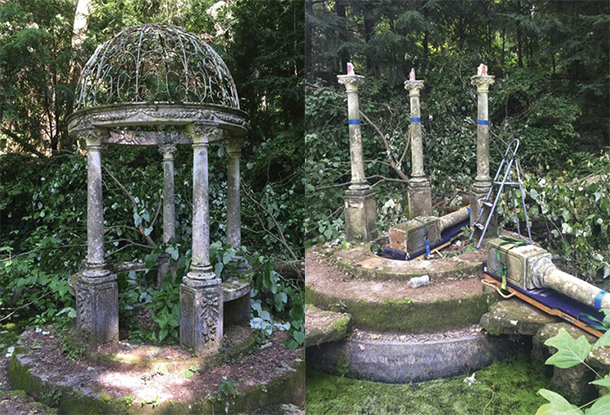 ➼ Most labor-intensive job: A limestone gazebo whose 500-pound pieces had to be carried out through an estate garden with a koi pond. “If you misstepped six inches, you were knee-high in water,” recalls Westbrook. Photographs courtesy of Westbrook Corp.